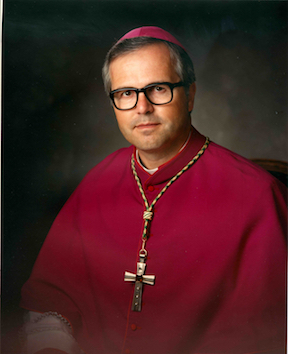 Bishop Jerome G. Hanus, O.S.B. Bishop Hanus came to the Diocese of St. Cloud with the motto: “to serve rather than rule.” By all accounts, Bishop Hanus lived up to his motto. He was a collaborative leader, a good listener and had an uncanny ability to remember names and faces. Bishop Hanus used exercise and card games to connect with the people of St. Cloud. He made time for racquetball with parishioners, cards with his fellow priests and an occasional fishing trip with Bishop Speltz. During his time in St. Cloud, Bishop Hanus promoted health care as a ministry of the church. He supported Catholic health care institutions, encouraged the hiring of parish nurses and gave the laity a greater role in the health care mission of the church. Bishop Hanus improved diocesan finances by professionalizing accounting processes and investments. He initiated a capital campaign for the priests’ retirement fund and hired a diocesan development director. Bishop Hanus also increased pay and benefits for diocesan staff (both lay and religious). In addition to his health care and finance initiatives, Bishop Hanus also restructured the guidelines for permanent deacons and pastoral associates. He approved new processes for screening, selecting and training candidates. He is retired and resides at Conception Abbey, Mo.